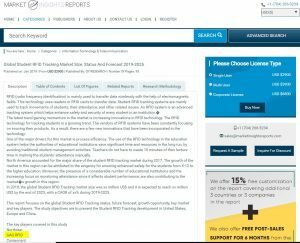 Global Student RFID Tracking Market Size, Status And Forecast 2019-2025 - GAO RFID Inc.
RFID based student tracking system is mainly used to track students, their attendance and other related issues. RFID technology in the education system helps to significantly reduce time and resources by avoiding traditional student management activities. The major driver of Student RFID market is process efficiency. North America currently has the major of Global Student RFID tracking market. This is due to an exigency for ensuring enhanced safety for the students. GAO RFID is considered as one of the Key Players in the market. The GAO RFID Personnel Tracking System is an integrated tracking solution that can monitor personnel in real-time, enabling you to improve workplace safety, increase productivity while tracking time and attendance. These features make our personnel tracking system an ideal choice for School authorities in tracking students.